Welcome to the world, little one! Lindsey’s baby shower to welcome her little bun in the oven, Brock, was an extravaganza with the theme of airplanes, travel, and this beautiful world we live in. The baby shower took place on a sunny day in Laguna Beach, CA at The Montage, an ocean side resort over looking the best Orange County has to offer. The baby shower was planned by our friends at Details Details and what an amazing job they did. With a color scheme made to perfection for the theme - baby blue and rich red with a large amount of crisp clean white- we created a backdrop that was a crowd pleaser! Continue with the baby blue, the backdrop was painted with bright bold lettering of “Welcome to the World”. Accented with white toy airplanes and white balloons to frame the top, it was a picture perfect moment! With countless round tables scattered throughout the grass, guests enjoyed a meal with a breathtaking view of the Laguna beaches. The centerpieces at each table were held in a light wood box with an abundance of fresh white florals. This added the right amount of umph without being a distraction to the overall design. 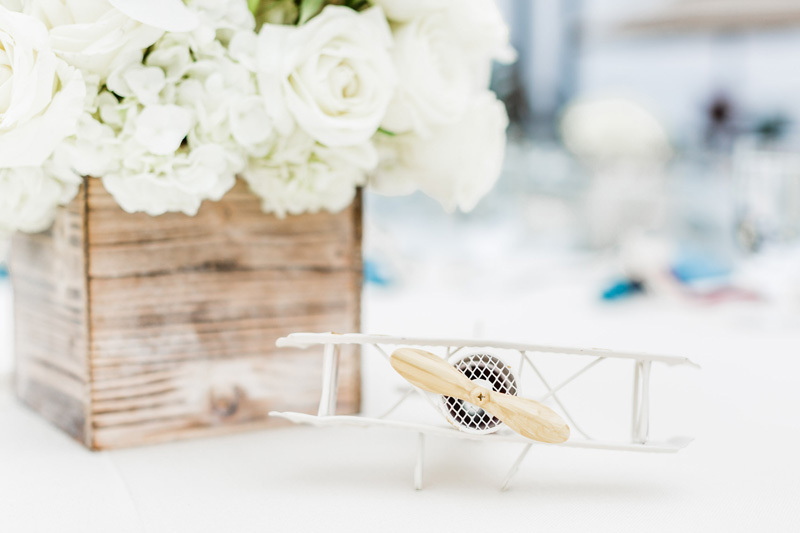 Smaller toy airplanes were sprinkled throughout the tablescapes as well to incorporate the design in a classy way. As we welcome Baby Brock into this world, we thank his parents and the creative team for this event! We hope to see baby Brock soon and that he looks back at these pictures and is proud of the event is family put on for him. Cheers!